Tent stoves are primitive lightweight stoves for heating wall-tents (canvas hunting tents) or ice huts. They are essentially a barrel, door and a chimney. Not the most efficient stoves nor the cleanest burning but they are cheap and they do provide heat. While these little stoves are not made to be permanently installed in a living space they can provide heat in a pinch as shown by this young family. American Family Now (A young couple with 4 kids) lives in a RV off-the-grid. The family is building a little homestead with cash and every penny matters. To save on heating (kerosene) they installed a simple stove tent that can be purchased on ebay for around $50. The stove was then vented through the roof using flashing fashioned into a custom adapter. 2-you really should have a fan to move air otherwise you get cold spots in irritating areas. 3-the stove is small and goes through wood quickly. You cannot let it be for more than an hour or so. We burn a few pieces of kindling at a time and load it every 20 min. At night we switch back to kerosene heat. 4-if you start putting chimneys in you rv make sure you can remove them in case you are needing to travel, or you’re having inspectors over to check on building stuff “don’t raise flags on things if you don’t need to”. 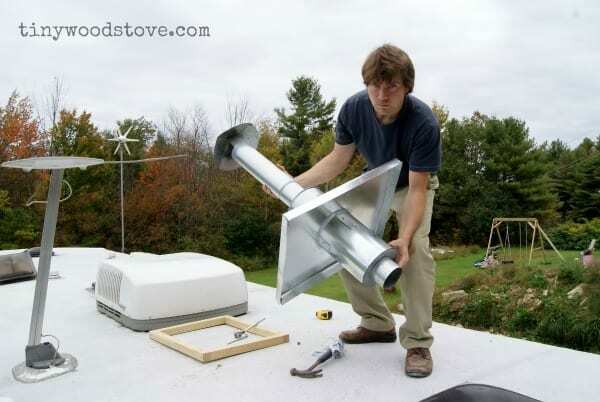 5-you if you have money to spend get a better wood stove. Kimberly wood stoves look really cool and are supper efficient, but cost $3500. Our $50 wood stove does work well but not like a higher quality one. 6-you will need heat reflectors shielding surrounding walls. 7-when you put a chimney through the roof first do some recon as to where trusses are and wires run. Installation is a pain, and potentially very dangerous if not done properly. Ours was an experiment, and when tested we got it really hot for a while to check temps around the areas touching wood. Nothing beyond 200 degrees was found. Here is the post on their installation. (The American Family Now Blog has been shut down…you can contact them or see their past updates on their facebook page.